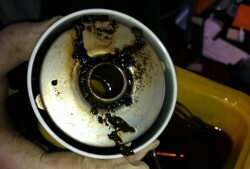 ‘Diesel bug’ can be effectively eradicated with MarShip’s Marine Fuel Purifier. The ‘Diesel Doctor’, aka Peter Weide, of MarShip UK, will be familiar to many in the fishing industry, given his ability to answer any questions you might have about diesel fuel, specifically maintaining its quality and avoiding or treating diesel-bug. MarShip UK’s expertise in this area is undeniable, having being built on 30 years of marine experience both at sea and ashore and its aim is simple; to prolong the life of your diesel engine. This is achieved through ensuring the vital elements of your engine – air, fuel and oil – are maintained in the very best condition. 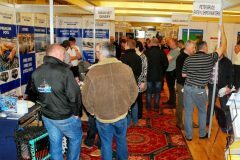 This will be MarShip UK’s third Galway show, and it is very much looking forward to helping visitors solve their fuel problems and answering any questions you may have about maintaining the quality of your fuel and dealing with blocked filters caused by diesel bug. MarShip UK works with two of the leading chemical additive manufacturers and has developed a specialist fuel additive range designed to address specific fuel issues, rather than the standard ‘catch-all’ which can be both expensive and unreliable. Alongside this is its Marine Fuel Purifier that, with no electrics, removes water from fuel meaning that diesel bug has nowhere to live, effectively eradicating the issue. Have a question or need more information? You will find MarShip UK on stand 68, where Peter and his team will be happy to help answer any questions you have. Måløy Maritime Group (MMG) was launched in October 2015 and is a joint venture of 11 companies, all operating in the maritime industry. The cluster is situated centrally on the west coast of Norway, along the north-south shipping fairway, and offers a complete range of services for the North Sea fishing fleet. All of the MMG companies have extensive experience in servicing the fishing fleet, as a result of Måløy’s position as the third major fish landing port in Norway. Each year a total of approx 350,000t of fish is landed in Måløy. The services provided by this cluster range from vessel design and engineering, new construction, conversions and repairs, to HVAC, electrical services, general supplies and bunkering. The capacity of their shipyards is impressive, with docking capacities of up 148m and a slipway with a lifting capacity of up to 4,000t. A prime example of what the cluster of MMG can produce is the pelagic fishing vessel Torbas, where 10 out of the 11 companies in MMG have been involved in building this state-of-the-art, 70m purse-seiner. Other examples of the capacity of the cluster are the conversions of Olgarry and Research, undertaken at Baatbygg, involving a handful of the companies in MMG. The Killybegs-based Olgarry was lengthened in late 2015. The expertise of MMG is high and its competence diverse, and as such you can characterise MMG as a one-stop-shop – situated right along the highway of the North Sea. MMG looks forward to meeting the industry and the fleet in Galway, and to providing information about the opportunities it can provide. ensures durability, resists corrosion and counteracts biofouling. Sometimes, all it takes is the introduction of one new element to shift the tide of an entire industry. Riverdale Mills (Northbridge, MA USA) revolutionised the lobster fishing industry over 35 years ago when the company created Aquamesh®, a first of its kind marine-grade welded wire mesh fabric, designed specifically to create a more sturdy, weather and corrosion-resistant lobster pot. 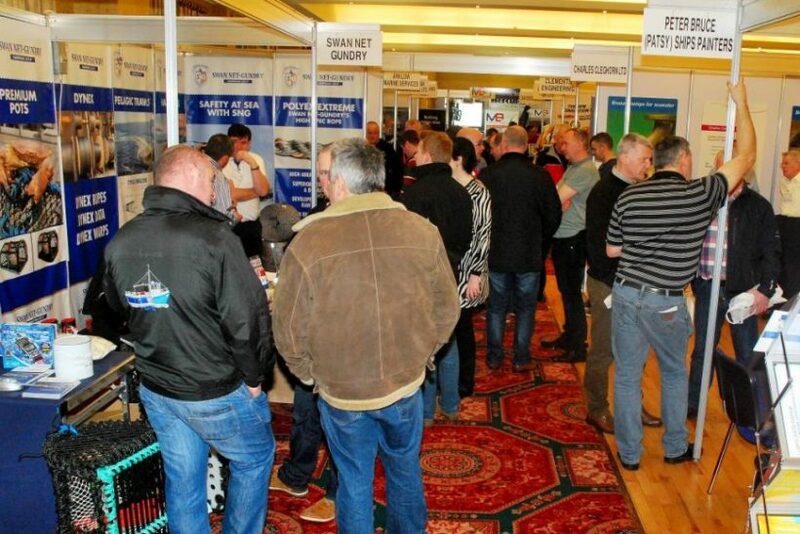 The demand for Aquamesh in Ireland has grown exponentially in the past three years and Riverdale Mills is committed to meeting the demands of the Irish fishing market – which is why the company is exhibiting at this year’s Galway expo. “The history of Riverdale Mills is a story much akin to the legacy of Irish fishermen: one of passion and perseverance,” said James Knott, Jr, Riverdale Mills CEO. Fourth generation, North Mayo fisherman Pat ‘The Chief’ O’Donnell wholeheartedly agrees with Mr Knott. Since 2012, The Chief has used traps made with Aquamesh for his Porturlin Harbour fleet. “Aquamesh is an incredibly versatile product. We have been building our own crab and lobster creels and experimenting with various configurations, including D creels and square pots. The traps made with Aquamesh fish as well as, and often better than, the old creels,” said Pat. The Chief also knows the galvanising process used to manufacture Aquamesh is one of the elements that makes the product great. Aquamesh is produced using Riverdale’s proprietary Galvanised After Welding (GAW) and PVC coating process to resist corrosion, maximise durability, and it also naturally counteracts biofouling. Galvanising the wire mesh with a protective zinc coating retards rust and is the key to product durability. If zinc is applied to wire strands before they are welded together (GBW), the wire junctions lose their galvanised protection. When zinc is applied after welding (using GAW), traps typically last four to five times longer than traps made using the GBW process. syncrolift, after being repainted by PBP services last year. PBP Services is looking forward to welcoming visitors to the Fraserburgh company’s stand, before which they will have met existing and prospective customers while travelling round a number of ports in Ireland. 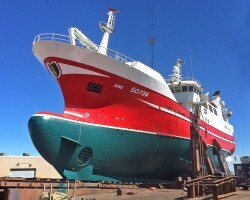 The Fraserburgh-based marine coatings specialists PBP Services continue to be at the forefront of new preparation and painting technologies for the fishing fleet, following substantial investment in new robotic blast-cleaning equipment. The first to be supplied to the UK, the hi-tech machinery was used for the first time this month in Peterhead Port Authority’s ship hall just prior to Galway Exhibition. PBP Services works managers Peter Alexander and Jonathan Bruce commented: “We had a very positive time at Galway last year. This led to us taking a team to Ireland to carry out surface preparation work and painting in Killybegs to the midwater pair-trawlers Girl Stephanie, Aine and Neptune. The Aine and Neptune are due to utilise the Fraserburgh dry dock later on this year. 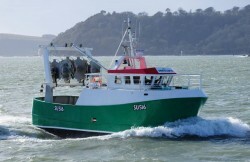 “When the contracts were completed at Killybegs, the PBP Services team then spent several months working on vessels in Cloggerhead, Howth, New Ross and Kilkeel, where we developed some great relationships and provided excellent service which left the owners of these vessels very satisfied after completing works on Supreme, Stella Nova, St Catherine Laboure, Margaret Mary and Georgia W.
“Last year was extremely busy, not only in Ireland and Scotland, but also internationally. For the first time we were asked by some of our customers – Aine, Brendelen and Christina S – to go to Karstensen Shipyard in Skagen to assist with the preparation and painting of these pelagic vessels. This work was completed to the owners’ satisfaction during the summer months. “As well as repainting all classes of boats from north-east Scotland in their local harbours, we were very happy last year to provide a bespoke service for skippers from Greenland, Norway and Faroe, who steamed to Fraserburgh and Peterhead to have further work carried out. This included blast cleaning and coating services, fishroom refits and a new one-hour cure deck/flooring resin. For further enquiries please call Peter Bruce 07831 260109. Charles Cleghorn Ltd has long been a supporter of Skipper Expo Galway and this year is pleased to be able to showcase the ENAG range of specialist marine electrical goods, in addition to its pump range. All backed by design criteria to BV standards, ENAG makes marine ventilation fans, heaters, battery-charging systems, etc, which have been widely fitted to continental-made vessels for many years. These can now be supplied by Charles Cleghorn for new installations, or to replace units on ex-euro vessels in the British and Irish fleets. Port Tours, held throughout March. Cummins understands the importance of reliable, dependable power in the toughest of environments. Offering a wide range of marine propulsion and auxiliary engines (78-3130 kW), with generator sets (4-1725 kWe), Cummins has specifically designed products to meet the challenging needs of commercial marine applications, from diesel electric, to emergency power and bow thrusters. Factory-trained marine application engineers will help you select the right specification, and qualified marine technicians keep you up and running, once in service. Based in the USA, Cummins is the world’s largest independent manufacturer of diesel engines; building over one million engines per annum, powering more types of equipment in more markets than any other engine company and serving thousands of customers in around 190 countries. Cummins has over 50,000 employees globally, around 600 company-owned and independent distributor locations, and approximately 7,200 dealer locations worldwide, enabling its products to be supported at every major port by an international distributor network. The Cummins brand is very well known in Ireland, having established its presence over 25 years ago, in Dublin. In January 2016, it moved to a brand new, purpose-built office and workshop location in the north of the city. With good transport links, the new site was chosen as an ideal location to support its customers across Ireland, including its parts support team, modern workshop and office facilities. Cummins Ireland operates in all markets, including commercial and recreational marine, industrial, automotive and power generation. Field-based technicians, together with a dealer network, also provide extensive support to customers across Ireland. During the expo, you can meet the Cummins marine team and see its latest engine and generator set range, including a live demonstration of an engine rebuild. Further information about the tours can be found at www.cumminseurope.com or on Twitter@CumminsEurope. Globeweigh’s introduction to the Irish Market of the Unisystems range of marine scales has been a great success, allowing skippers to accurately weigh and box their catches at sea, with trade-approved scales. With the release of the Globeweigh’s Catch Report and Fish Traceability system (CRAFT) at-sea efficiencies have now been greatly increased, allowing catches to be labelled to comply with EC legislation with full traceability. This allows catches to be brought to shore already weighed, labelled and ready for sale. The system will give a full inventory of species type and catch area, producing a GS1 barcode on the labels, which is compatible with all compliant systems. The CRAFT system has been designed with the skipper in mind; the unique touchscreen interface allows label information to be changed with a couple of touches and there are two versions available. One for use with fixed-weight boxes, where the system can be located in the wheelhouse, the other encased in a 316-grade stainless steel enclosure for variable weight labelling in the hold. Both systems will be on display on the Globeweigh stand. New office for Prolines charts the success and growth of this Waterford company. Prolines Naval Architects is Ireland’s only independent chartered Naval architects, with nearly two decades of trading in both the commercial and non-commercial sectors of the marine industry. 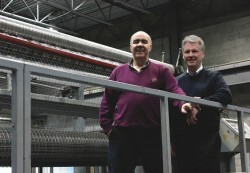 The McConnell brothers have successfully expanded their business over the past few years, with an even broader vision for the future, having re-located to new high-tech offices at the Airport Business Park in Waterford. Prolines has also recruited a new business development manager and has started the process of becoming ISO 2001 compliant. Last year saw the company successfully completing a multi-million euro project for one of the largest multinationals in the world. Prolines has worked internationally with shipyards in the UK, France and Holland and this year has expanded to include Denmark and Turkey. As well as original design work, Prolines also specialises in refit and modifications, broadening services to include Non Destructive Testing (NDT), classification-approved Ultra Sonic Testing, Dyepen and Vac-Box weld testing. Prolines is currently organising affiliation with three of the UK’s largest coding authorities. With over 700 loyal clients, both Rob and Brian McConnell have established a reputation for quality and accuracy, to ensure that the client’s needs are met in an efficient and trustworthy manner. 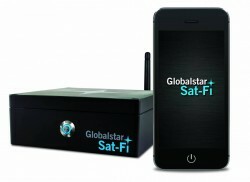 Stay in touch, with Globalstar. Globalstar is the leader in satellite messaging and emergency notification technologies, and has been steadily building a reputation in the commercial fishing community for satellite communications solutions that are both state-of-the-art and highly affordable. GSP-1700 Handheld Satellite Phone: Ideal for any fisherman who wants to make voice calls and be online while out at sea. With an RRP of €490 and a choice of very competitive voice and data tariffs, it offers crystal-clear voice quality and the fastest handheld data speeds available. GSP-1700 Marine Kit: Designed for use at sea, the marine helix antenna and various cable length options are ideal for all vessel sizes. The GSP-1700 Marine Kit retails at an RRP of €1,599. Pre-paid & Post-paid Voice and Data: Globalstar offers the mobile satellite communications industry’s lowest cost pre-paid and post-paid voice and data service. Globalstar 9600™: With the 9600, Globalstar customers can use a convenient app to seamlessly pair their existing satellite phone and smartphone to send and receive email. Spirited Lady III, sporting Houdini windows. 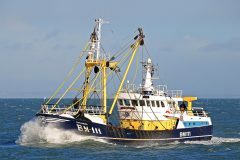 Houdini Marine Windows Ltd says it is delighted to be exhibiting, and as a long-term supplier of windows and doors to fishing fleets, it is looking forward to meeting existing and potential customers at the show. Houdini Marine Windows Ltd offers a range of bolt on, and clamp section windows and doors to ISO 12216 and Seafish standards. It supplies to fishing boats worldwide, from Scandinavia and Iceland to South Africa, Sri Lanka and beyond. Houdini Marine Windows Ltd has a worldwide reputation for quality and innovation from over 50 years’ experience in the commercial vessel glazing industry. For our final taster of the many exhibitors that will be found at the 2016 Galway Expo Int. at the weekend, check back tomorrow.